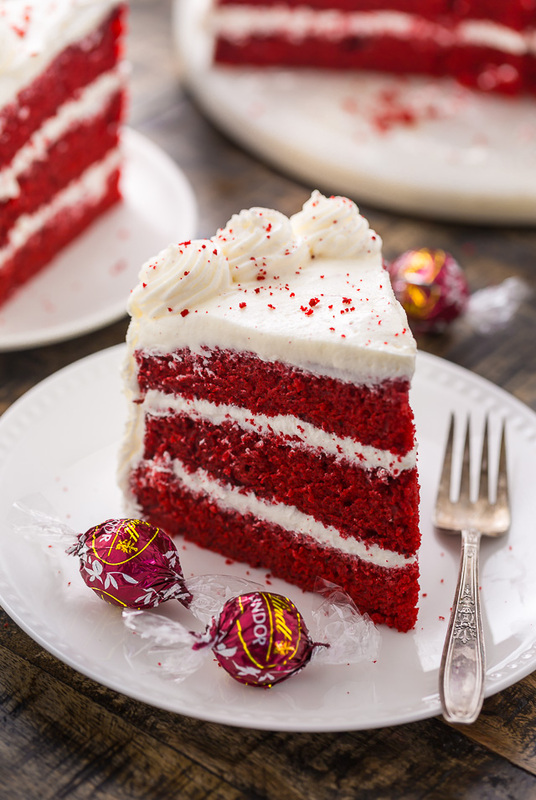 Moist and flavorful, this White Chocolate Red Velvet Truffle Cake is equally beautiful and delicious! If you’re still searching for the perfect recipe to impress your Valentine with, this post is for you! and perfect for special occasions! Because we want the moistest cake possible, this recipe calls for cake flour. 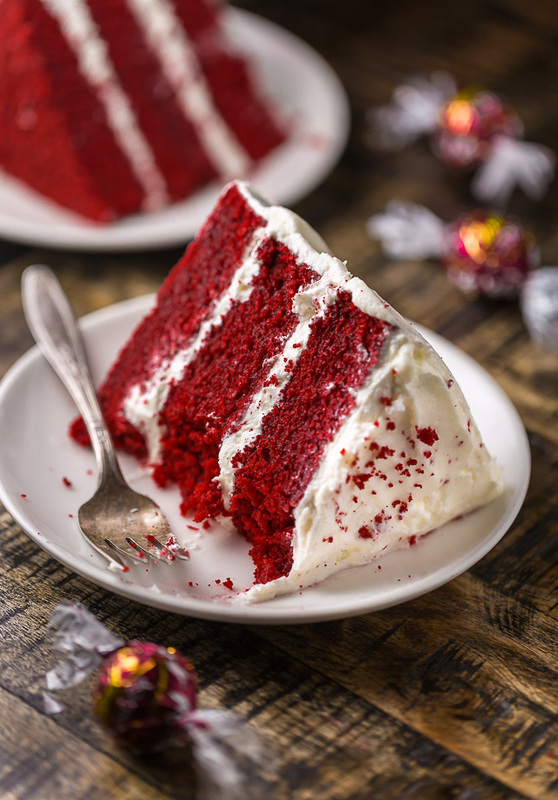 Cake flour is extra finely ground and helps create a cake with that’s nice and moist. In most grocery stores, you can find cake flour in the baking aisle. You can also buy it online here. If you cannot find cake flour where you live, don’t fret! Making your own cake flour is easy, and only requires two ingredients: cornstarch and all-purpose flour. Here’s what you do: For every 1 cup of flour called for in the recipe, remove 2 Tbsp of flour. Then add in 2 Tbsp of Cornstarch for every 1 cup of flour (you’re replacing the tablespoons of flour taken out with cornstarch). Sift this mixture a few times (you want it well combined) and that’s it; you just made ready-to-use cake flour. When you measure your cake flour, be sure you’re not packing it into the measuring cup. Instead, lightly scoop the flour into the measuring cup, then level it off with a knife. Packed flour will yield a dense and dry cake. This recipe calls for unsweetened cocoa powder, which is different from Dutch-process cocoa powder. Be sure to check the labels so you purchase the right one! For best results, the dry ingredients must be sifted together. Because I never like to give you pointless extra steps, I tested this cake with unsifted ingredients and it was not good. Be sure you don’t over mix the batter! It’ll be thick and luscious. Over mixing will cause the cake to bake up dry. For the white chocolate frosting, you’ll want to make sure your butter is VERY soft before creaming it. You’ll also want to use quality white chocolate, such as Lindt. I don’t suggest melting white chocolate chips. Be sure to cool the melted white chocolate and LINDOR Red Velvet Truffles for at least 10 minutes before adding them to the recipe when called for. They should be completely melted, but cool to the touch. I brought this cake to a Galentine’s Day party last week and it was a huge hit with my girlfriends! 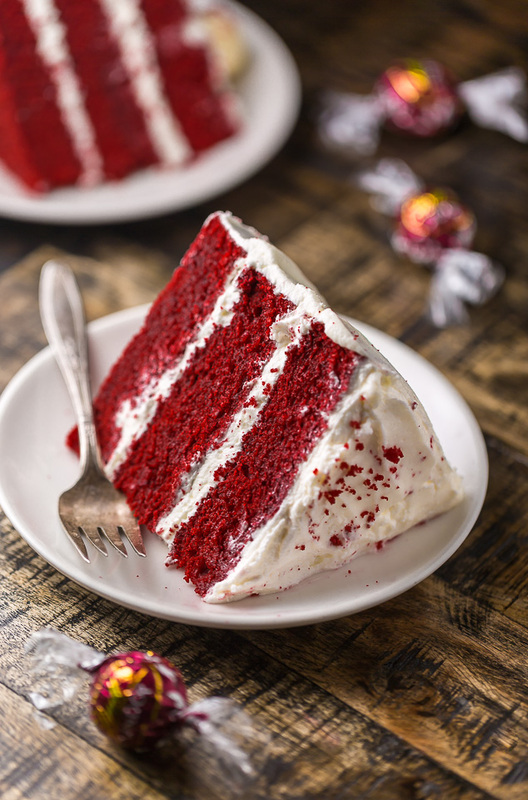 So if you’re a red velvet lover and you’ve been searching for a new spin on the recipe, give this one a try SOON. 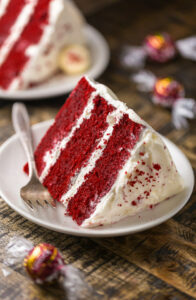 If you try this recipe for White Chocolate Red Velvet Truffle Cake, let me know! 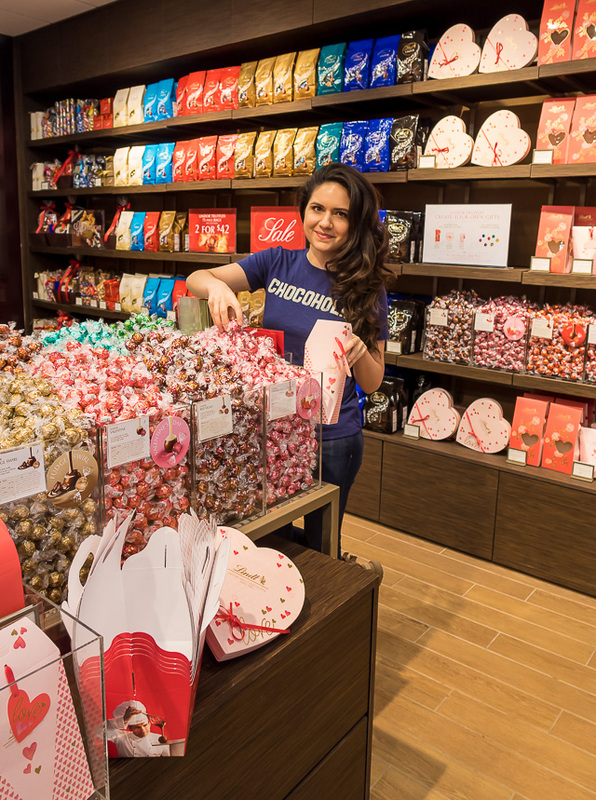 Leave a comment below and don’t forget to snap a pic and tag it #bakerbynature and #LindtChocolateShop on instagram! Seeing your kitchen creations makes my day. 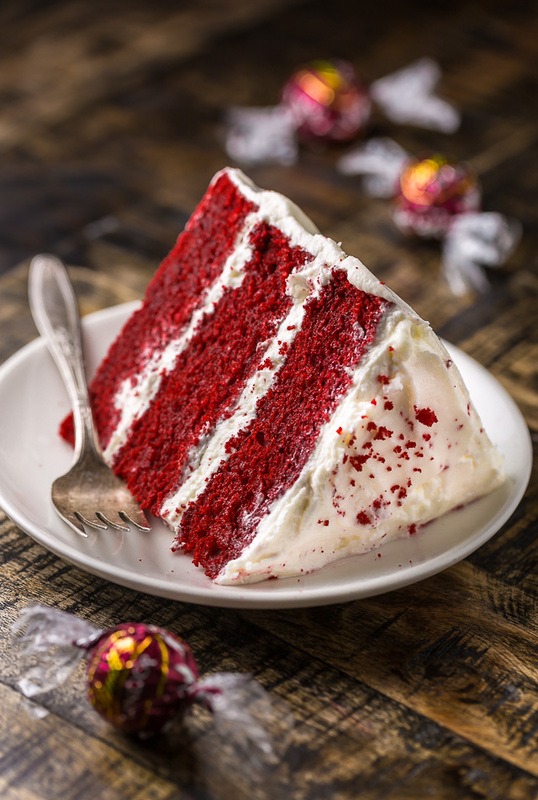 Moist and flavorful, this White chocolate Red Velvet Cake is equally beautiful and delicious! Sift together the cake flour, baking soda, cocoa powder, espresso powder, and salt. Set aside. In the bowl of a stand mixer fitted with the paddle attachment, or in a large bowl using a handheld electric mixer, cream the butter, oil, and both sugars together on medium-low speed for 6 to 8 minutes, or until the mixture is light in color and very thick, scraping down the sides of the bowl as needed. Add in the eggs, one at a time, beating well after each addition. 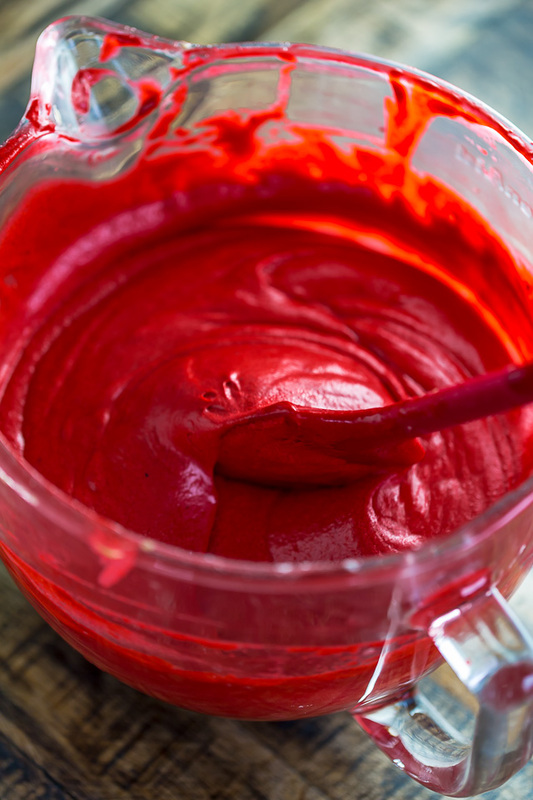 Add in the food coloring, vinegar, and vanilla and beat smooth, about 1 to 2 minutes, scraping the sides of the bowl as needed. Add the sifted dry ingredients in thirds, alternating with the buttermilk, beginning and ending with the flour. Finally, fold in the melted truffles and beat for about 30 seconds, or until evenly incorporated. Remove the bowl from the mixer and, using a silicon spatula, give the batter one last stir, being sure to scrape the bottom and sides of the bowl to catch any ingredients that may have been missed by the mixer. Divide the batter evenly among the prepared pans and smooth the tops with a spatula. Bake for 20 to 22 minutes, or until a cake tester inserted in the center comes out clean. Cool cakes in the pan, placed on a wire rack, for 15 minutes, then remove the pans and cool cakes completely on wire racks. In the bowl of a stand mixer fitted with the paddle attachment, or in a large bowl using a handheld electric mixer, beat the butter on medium-speed until completely smooth. Reduce the speed to low and gradually add in the confectioners' sugar, beating until all of the sugar is completely combined. Add in the salt, cream, and vanilla extract and beat smooth. Add in the white chocolate and beat smooth. Once all of the ingredients have been incorporated, increase the speed to medium-high and beat for a minute. Using a serrated knife, carefully trim the raised top of each cake, making each one an even, level surface. Transfer 1 layer to a large plate or cake stand. Spread an even layer of frosting on top, then top with another cake layer, and repeat. Top with the final cake layer. Frost the top and sides of the cake. Slice and serve, or keep refrigerated for up to 3 days. Hey, is there any other chocolate I can use instead of LINDOR red velvet truffle? They are very difficult to find easily. 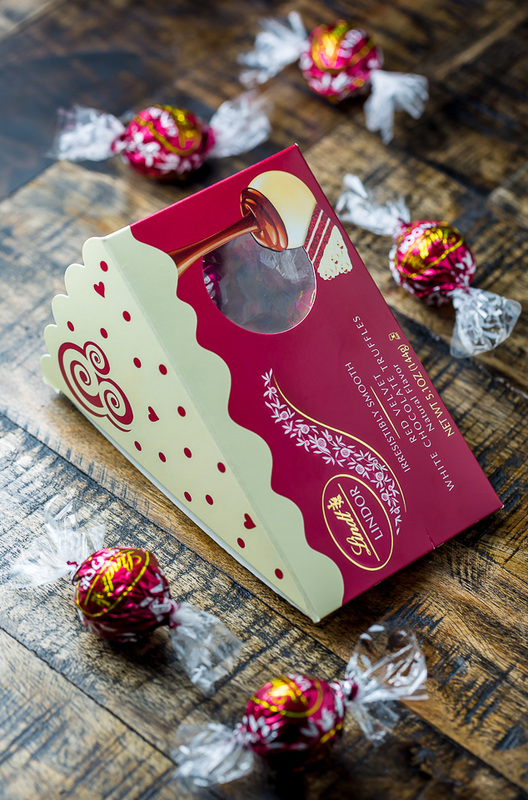 Hi there, I love the sound of this recipe and I actually have the Red velvet Lindt truffles! They are amazing and I wish they weren’t limited edition. My question is, are the ingredients such as cider vinegar and espresso powder completely essential for the cake? I don’t have these in my cupboard so just wondering if I can leave it out? Thanks! One question, can I leave out the Lindt Chocolates in the batter? Thanks Ashley for sharing such a lovely recipe. Though I may not try it as these kinds of chocolates are not available here.